The purpose of this module is to provide a brief review of attachment theory—a theory designed to explain the significance of the close, emotional bonds that children develop with their caregivers and the implications of those bonds for understanding personality development. The module discusses the origins of the theory, research on individual differences in attachment security in infancy and childhood, and the role of attachment in adult relationships. Explain the way the attachment system works and its evolutionary significance. Identify three commonly studied attachment patterns and what is known about the development of those patterns. Describe what is known about the consequences of secure versus insecure attachment in adult relationships. Some of the most rewarding experiences in people’s lives involve the development and maintenance of close relationships. For example, some of the greatest sources of joy involve falling in love, starting a family, being reunited with distant loved ones, and sharing experiences with close others. And, not surprisingly, some of the most painful experiences in people’s lives involve the disruption of important social bonds, such as separation from a spouse, losing a parent, or being abandoned by a loved one. Why do close relationships play such a profound role in human experience? Attachment theory is one approach to understanding the nature of close relationships. In this module, we review the origins of the theory, the core theoretical principles, and some ways in which attachment influences human behavior, thoughts, and feelings across the life course. Attachment theory was originally developed in the 1940s by John Bowlby, a British psychoanalyst who was attempting to understand the intense distress experienced by infants who had been separated from their parents. Bowlby (1969) observed that infants would go to extraordinary lengths to prevent separation from their parents or to reestablish proximity to a missing parent. For example, he noted that children who had been separated from their parents would often cry, call for their parents, refuse to eat or play, and stand at the door in desperate anticipation of their parents’ return. At the time of Bowlby’s initial writings, psychoanalytic writers held that these expressions were manifestations of immature defense mechanisms that were operating to repress emotional pain. However, Bowlby observed that such expressions are common to a wide variety of mammalian species and speculated that these responses to separation may serve an evolutionary function (see Focus Topic 1). When Bowlby was originally developing his theory of attachment, there were alternative theoretical perspectives on why infants were emotionally attached to their primary caregivers (most often, their biological mothers). Bowlby and other theorists, for example, believed that there was something important about the responsiveness and contact provided by mothers. Other theorists, in contrast, argued that young infants feel emotionally connected to their mothers because mothers satisfy more basic needs, such as the need for food. That is, the child comes to feel emotionally connected to the mother because she is associated with the reduction of primary drives, such as hunger, rather than the reduction of drives that might be relational in nature. In a classic set of studies, psychologist Harry Harlow placed young monkeys in cages that contained two artificial, surrogate “mothers” (Harlow, 1958). One of those surrogates was a simple wire contraption; the other was a wire contraption covered in cloth. Both of the surrogate mothers were equipped with a feeding tube so that Harrow and his colleagues had the option to allow the surrogate to deliver or not deliver milk. Harlow found that the young macaques spent a disproportionate amount of time with the cloth surrogate as opposed to the wire surrogate. Moreover, this was true even when the infants were fed by the wire surrogate rather than the cloth surrogate. This suggests that the strong emotional bond that infants form with their primary caregivers is rooted in something more than whether the caregiver provides food per se. Harlow’s research is now regarded as one of the first experimental demonstrations of the importance of “contact comfort” in the establishment of infant–caregiver bonds. Drawing on evolutionary theory, Bowlby (1969) argued that these behaviors are adaptive responses to separation from a primary attachment figure—a caregiver who provides support, protection, and care. Because human infants, like other mammalian infants, cannot feed or protect themselves, they are dependent upon the care and protection of “older and wiser” adults for survival. Bowlby argued that, over the course of evolutionary history, infants who were able to maintain proximity to an attachment figure would be more likely to survive to a reproductive age. According to Bowlby, a motivational system, what he called the attachment behavioral system, was gradually “designed” by natural selection to regulate proximity to an attachment figure. The attachment system functions much like a thermostat that continuously monitors the ambient temperature of a room, comparing that temperature against a desired state and adjusting behavior (e.g., activating the furnace) accordingly. In the case of the attachment system, Bowlby argued that the system continuously monitors the accessibility of the primary attachment figure. If the child perceives the attachment figure to be nearby, accessible, and attentive, then the child feels loved, secure, and confident and, behaviorally, is likely to explore his or her environment, play with others, and be sociable. If, however, the child perceives the attachment figure to be inaccessible, the child experiences anxiety and, behaviorally, is likely to exhibit attachment behaviors ranging from simple visual searching on the low extreme to active searching, following, and vocal signaling on the other. These attachment behaviors continue either until the child is able to reestablish a desirable level of physical or psychological proximity to the attachment figure or until the child exhausts himself or herself or gives up, as may happen in the context of a prolonged separation or loss. Although Bowlby believed that these basic dynamics captured the way the attachment system works in most children, he recognized that there are individual differences in the way children appraise the accessibility of the attachment figure and how they regulate their attachment behavior in response to threats. However, it was not until his colleague, Mary Ainsworth, began to systematically study infant–parent separations that a formal understanding of these individual differences emerged. Ainsworth and her students developed a technique called the strange situation—a laboratory task for studying infant–parent attachment (Ainsworth, Blehar, Waters, & Wall, 1978). In the strange situation, 12-month-old infants and their parents are brought to the laboratory and, over a period of approximately 20 minutes, are systematically separated from and reunited with one another. In the strange situation, most children (about 60%) behave in the way implied by Bowlby’s normative theory. Specifically, they become upset when the parent leaves the room, but, when he or she returns, they actively seek the parent and are easily comforted by him or her. Children who exhibit this pattern of behavior are often called secure. Other children (about 20% or less) are ill at ease initially and, upon separation, become extremely distressed. Importantly, when reunited with their parents, these children have a difficult time being soothed and often exhibit conflicting behaviors that suggest they want to be comforted, but that they also want to “punish” the parent for leaving. These children are often called anxious-resistant. The third pattern of attachment that Ainsworth and her colleagues documented is often labeled avoidant. Avoidant children (about 20%) do not consistently behave as if they are stressed by the separation but, upon reunion, actively avoid seeking contact with their parent, sometimes turning their attention to play objects on the laboratory floor. Ainsworth’s work was important for at least three reasons. First, she provided one of the first empirical demonstrations of how attachment behavior is organized in unfamiliar contexts. Second, she provided the first empirical taxonomy of individual differences in infant attachment patterns. According to her research, at least three types of children exist: those who are secure in their relationship with their parents, those who are anxious-resistant, and those who are anxious-avoidant. Finally, she demonstrated that these individual differences were correlated with infant–parent interactions in the home during the first year of life. Children who appear secure in the strange situation, for example, tend to have parents who are responsive to their needs. Children who appear insecure in the strange situation (i.e., anxious-resistant or avoidant) often have parents who are insensitive to their needs, or inconsistent or rejecting in the care they provide. In the years that have followed Ainsworth’s ground-breaking research, researchers have investigated a variety of factors that may help determine whether children develop secure or insecure relationships with their primary attachment figures. As mentioned above, one of the key determinants of attachment patterns is the history of sensitive and responsive interactions between the caregiver and the child. In short, when the child is uncertain or stressed, the ability of the caregiver to provide support to the child is critical for his or her psychological development. It is assumed that such supportive interactions help the child learn to regulate his or her emotions, give the child the confidence to explore the environment, and provide the child with a safe haven during stressful circumstances. Evidence for the role of sensitive caregiving in shaping attachment patterns comes from longitudinal and experimental studies. For example, Grossmann, Grossmann, Spangler, Suess, and Unzner (1985) studied parent–child interactions in the homes of 54 families, up to three times during the first year of the child’s life. At 12 months of age, infants and their mothers participated in the strange situation. Grossmann and her colleagues found that children who were classified as secure in the strange situation at 12 months of age were more likely than children classified as insecure to have mothers who provided responsive care to their children in the home environment. Van den Boom (1994) developed an intervention that was designed to enhance maternal sensitive responsiveness. When the infants were 9 months of age, the mothers in the intervention group were rated as more responsive and attentive in their interaction with their infants compared to mothers in the control group. In addition, their infants were rated as more sociable, self-soothing, and more likely to explore the environment. At 12 months of age, children in the intervention group were more likely to be classified as secure than insecure in the strange situation. Attachment researchers have studied the association between children’s attachment patterns and their adaptation over time. Researchers have learned, for example, that children who are classified as secure in the strange situation are more likely to have high functioning relationships with peers, to be evaluated favorably by teachers, and to persist with more diligence in challenging tasks. In contrast, insecure-avoidant children are more likely to be construed as “bullies” or to have a difficult time building and maintaining friendships (Weinfield, Sroufe, Egeland, & Carlson, 2008). Social media websites and mobile communication services are coming to play an increasing role in people’s lives. Many people use Facebook, for example, to keep in touch with family and friends, to update their loved ones regarding things going on in their lives, and to meet people who share similar interests. Moreover, modern cellular technology allows people to get in touch with their loved ones much easier than was possible a mere 20 years ago. From an attachment perspective, these innovations in communications technology are important because they allow people to stay connected virtually to their attachment figures—regardless of the physical distance that might exist between them. Recent research has begun to examine how attachment processes play out in the use of social media. Oldmeadow, Quinn, and Kowert (2013), for example, studied a diverse sample of individuals and assessed their attachment security and their use of Facebook. Oldmeadow and colleagues found that the use of Facebook may serve attachment functions. For example, people were more likely to report using Facebook to connect with others when they were experiencing negative emotions. In addition, the researchers found that people who were more anxious in their attachment orientation were more likely to use Facebook frequently, but people who were more avoidant used Facebook less and were less open on the site. On the basis of these parallels, Hazan and Shaver (1987) argued that adult romantic relationships, such as infant–caregiver relationships, are attachments. According to Hazan and Shaver, individuals gradually transfer attachment-related functions from parents to peers as they develop. Thus, although young children tend to use their parents as their primary attachment figures, as they reach adolescence and young adulthood, they come to rely more upon close friends and/or romantic partners for basic attachment-related functions. Thus, although a young child may turn to his or her mother for comfort, support, and guidance when distressed, scared, or ill, young adults may be more likely to turn to their romantic partners for these purposes under similar situations. I am somewhat uncomfortable being close to others; I find it difficult to trust them completely, difficult to allow myself to depend on them. I am nervous when anyone gets too close, and often, others want me to be more intimate than I feel comfortable being. I find it relatively easy to get close to others and am comfortable depending on them and having them depend on me. I don’t worry about being abandoned or about someone getting too close to me. I find that others are reluctant to get as close as I would like. I often worry that my partner doesn’t really love me or won’t want to stay with me. I want to get very close to my partner, and this sometimes scares people away. Conceptually, these descriptions were designed to represent what Hazan and Shaver considered to be adult analogues of the kinds of attachment patterns Ainsworth described in the strange situation (avoidant, secure, and anxious, respectively). Hazan and Shaver (1987) found that the distribution of the three patterns was similar to that observed in infancy. In other words, about 60% of adults classified themselves as secure (paragraph B), about 20% described themselves as avoidant (paragraph A), and about 20% described themselves as anxious-resistant (paragraph C). Moreover, they found that people who described themselves as secure, for example, were more likely to report having had warm and trusting relationships with their parents when they were growing up. In addition, they were more likely to have positive views of romantic relationships. Based on these findings, Hazan and Shaver (1987) concluded that the same kinds of individual differences that exist in infant attachment also exist in adulthood. Attachment theory has inspired a large amount of literature in social, personality, and clinical psychology. In the sections below, I provide a brief overview of some of the major research questions and what researchers have learned about attachment in adulthood. Who Ends Up with Whom? When people are asked what kinds of psychological or behavioral qualities they are seeking in a romantic partner, a large majority of people indicate that they are seeking someone who is kind, caring, trustworthy, and understanding—the kinds of attributes that characterize a “secure” caregiver (Chappell & Davis, 1998). But we know that people do not always end up with others who meet their ideals. Are secure people more likely to end up with secure partners—and, vice versa, are insecure people more likely to end up with insecure partners? The majority of the research that has been conducted to date suggests that the answer is “yes.” Frazier, Byer, Fischer, Wright, and DeBord (1996), for example, studied the attachment patterns of more than 83 heterosexual couples and found that, if the man was relatively secure, the woman was also likely to be secure. One important question is whether these findings exist because (a) secure people are more likely to be attracted to other secure people, (b) secure people are likely to create security in their partners over time, or (c) some combination of these possibilities. Existing empirical research strongly supports the first alternative. For example, when people have the opportunity to interact with individuals who vary in security in a speed-dating context, they express a greater interest in those who are higher in security than those who are more insecure (McClure, Lydon, Baccus, & Baldwin, 2010). However, there is also some evidence that people’s attachment styles mutually shape one another in close relationships. For example, in a longitudinal study, Hudson, Fraley, Vicary, and Brumbaugh (2012) found that, if one person in a relationship experienced a change in security, his or her partner was likely to experience a change in the same direction. Research has consistently demonstrated that individuals who are relatively secure are more likely than insecure individuals to have high functioning relationships—relationships that are more satisfying, more enduring, and less characterized by conflict. For example, Feeney and Noller (1992) found that insecure individuals were more likely than secure individuals to experience a breakup of their relationship. In addition, secure individuals are more likely to report satisfying relationships (e.g., Collins & Read, 1990) and are more likely to provide support to their partners when their partners were feeling distressed (Simpson, Rholes, & Nelligan, 1992). Do Early Experiences Shape Adult Attachment? The majority of research on this issue is retrospective—that is, it relies on adults’ reports of what they recall about their childhood experiences. This kind of work suggests that secure adults are more likely to describe their early childhood experiences with their parents as being supportive, loving, and kind (Hazan & Shaver, 1987). A number of longitudinal studies are emerging that demonstrate prospective associations between early attachment experiences and adult attachment styles and/or interpersonal functioning in adulthood. For example, Fraley, Roisman, Booth-LaForce, Owen, and Holland (2013) found in a sample of more than 700 individuals studied from infancy to adulthood that maternal sensitivity across development prospectively predicted security at age 18. Simpson, Collins, Tran, and Haydon (2007) found that attachment security, assessed in infancy in the strange situation, predicted peer competence in grades 1 to 3, which, in turn, predicted the quality of friendship relationships at age 16, which, in turn, predicted the expression of positive and negative emotions in their adult romantic relationships at ages 20 to 23. It is easy to come away from such findings with the mistaken assumption that early experiences “determine” later outcomes. To be clear: Attachment theorists assume that the relationship between early experiences and subsequent outcomes is probabilistic, not deterministic. Having supportive and responsive experiences with caregivers early in life is assumed to set the stage for positive social development. But that does not mean that attachment patterns are set in stone. In short, even if an individual has far from optimal experiences in early life, attachment theory suggests that it is possible for that individual to develop well-functioning adult relationships through a number of corrective experiences—including relationships with siblings, other family members, teachers, and close friends. Security is best viewed as a culmination of a person’s attachment history rather than a reflection of his or her early experiences alone. Those early experiences are considered important not because they determine a person’s fate, but because they provide the foundation for subsequent experiences. What kind of relationship did you have with your parents or primary caregivers when you were young? Do you think that had any bearing on the way you related to others (e.g., friends, relationship partners) as you grew older? There is variation across cultures in the extent to which people value independence. Do you think this might have implications for the development of attachment patterns? As parents age, it is not uncommon for them to have to depend on their adult children. Do you think that people’s history of experiences in their relationships with their parents might shape people’s willingness to provide care for their aging parents? In other words, are secure adults more likely to provide responsive care to their aging parents? Some people, despite reporting insecure relationships with their parents, report secure, well-functioning relationships with their spouses. What kinds of experiences do you think might enable someone to develop a secure relationship with their partners despite having an insecure relationship with other central figures in their lives? Most attachment research on adults focuses on attachment to peers (e.g., romantic partners). What other kinds of things may serve as attachment figures? Do you think siblings, pets, or gods can serve as attachment figures? A motivational system selected over the course of evolution to maintain proximity between a young child and his or her primary attachment figure. Behaviors and signals that attract the attention of a primary attachment figure and function to prevent separation from that individual or to reestablish proximity to that individual (e.g., crying, clinging). Someone who functions as the primary safe haven and secure base for an individual. In childhood, an individual’s attachment figure is often a parent. In adulthood, an individual’s attachment figure is often a romantic partner. (also called “attachment styles” or “attachment orientations”) Individual differences in how securely (vs. insecurely) people think, feel, and behave in attachment relationships. A laboratory task that involves briefly separating and reuniting infants and their primary caregivers as a way of studying individual differences in attachment behavior. Chappell, K. D., & Davis, K. E. (1998). Attachment, partner choice, and perception of romantic partners: An experimental test of the attachment-security hypothesis. Personal Relationships, 5, 327–342. Collins, N., & Read, S. (1990). Adult attachment, working models and relationship quality in dating couples. Journal of Personality and Social Psychology, 58, 644-663. Feeney, J. A., & Noller, P. (1992). Attachment style and romantic love: Relationship dissolution. Australian Journal of Psychology, 44, 69–74. Fraley, R. C., Roisman, G. I., Booth-LaForce, C., Owen, M. T., & Holland, A. S. (2013). Interpersonal and genetic origins of adult attachment styles: A longitudinal study from infancy to early adulthood. Journal of Personality and Social Psychology, 104, 8817-838. Frazier, P. A, Byer, A. L., Fischer, A. R., Wright, D. M., & DeBord, K. A. (1996). Adult attachment style and partner choice: Correlational and experimental findings. Personal Relationships, 3, 117–136. Grossmann, K., Grossmann, K. E., Spangler, G., Suess, G., & Unzner, L. (1985). Maternal sensitivity and newborns orientation responses as related to quality of attachment in northern Germany. Monographs of the Society for Research in Child Development, 50(1-2), 233–256. Harlow, H. F. (1958). The nature of love. American Psychologist, 13, 673–685. Hazan, C., & Shaver, P. R. (1987). Romantic love conceptualized as an attachment process. Journal of Personality and Social Psychology, 52, 511-524. Hudson, N. W., Fraley, R. C., Vicary, A. M., & Brumbaugh, C. C. (2012). Attachment coregulation: A longitudinal investigation of the coordination in romantic partners’ attachment styles. Manuscript under review. McClure, M. J., Lydon., J. E., Baccus, J., & Baldwin, M. W. (2010). A signal detection analysis of the anxiously attached at speed-dating: Being unpopular is only the first part of the problem. Personality and Social Psychology Bulletin, 36, 1024–1036. Oldmeadow, J. A., Quinn, S., & Kowert, R. (2013). Attachment style, social skills, and Facebook use amongst adults. Computers in Human Behavior, 28, 1142–1149. Simpson, J. A., Collins, W. A., Tran, S., & Haydon, K. C. (2007). Attachment and the experience and expression of emotions in adult romantic relationships: A developmental perspective. Journal of Personality and Social Psychology, 92, 355–367. Simpson, J. A., Rholes, W. S., & Nelligan, J. S. (1992). Support seeking and support giving within couples in an anxiety-provoking situation. Journal of Personality and Social Psychology, 62, 434–446. Weinfield, N. S., Sroufe, L. A., Egeland, B., Carlson, E. A. (2008). Individual differences in infant-caregiver attachment: Conceptual and empirical aspects of security. In J. Cassidy & P. R. Shaver (Eds. ), Handbook of attachment: Theory, research, and clinical applications (2nd ed., pp. 78–101). New York, NY: Guilford Press. van den Boom, D. C. (1994). The influence of temperament and mothering on attachment and exploration: An experimental manipulation of sensitive responsiveness among lower-class mothers with irritable infants. Child Development, 65, 1457–1477. 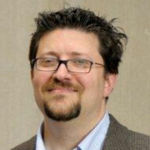 R. Chris Fraley is a professor at the University of Illinois's Department of Psychology. In 2007 he received the American Psychological Association's Distinguished Scientific Award for Early Career Contribution to Psychology in the area of Individual Differences. He conducts research on attachment, close relationships, and personality development. Attachment Through the Life Course by R. Chris Fraley is licensed under a Creative Commons Attribution-NonCommercial-ShareAlike 4.0 International License. Permissions beyond the scope of this license may be available in our Licensing Agreement.